Are we voting? Okay then. Of course, I gotta choose B if it's like my pudding cake. That was a-ma-zing! the goo factor is selling me on this one! I think thats a win win test. I wouldn't kick either out of bed, so to speak. 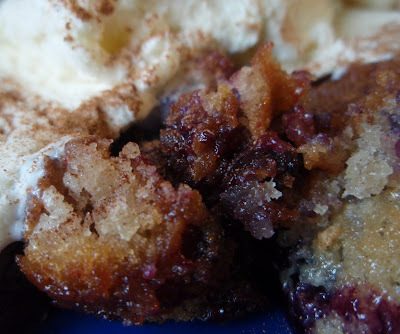 I am an equal opportunity cobbler eater. I have no problem eating any version...there is always something about each version that I can find to love! I am a B cobbler lover, love the goo, the more goo , the better! I'd have to say it would be hard to choose a winner too. I wouldn't refuse either. They both look awesome! Why should you have to choose?! Who could choose! They both look fabulously delicious! What a delightful situation to be in. Two delicious cobblers to taste test! Both do look great! WHy choose when you can have both? Blubeberry cobbler heaven! Mmmmm... I LOVE cobbler. And both of these look positively scrumptious! I adore cobblers! This one look mighty delicious! well if you know me by know I try my best to combine the two and have the best of both worlds. I love crunch and I love goo. hmm...it's like choc chip cookie recipes for me. Yum, I'll take either one. Please and thank you! Yes, please, a serving of each for me Grace! Those look incredible! I've been on a cobbler kick lately, so these will be a nice way to change things up. I'm really liking the sloppy goo mess of option B.
I am going to say I would be a fan of B, but both are so yummy looking! yes, I would love a nice big scoop of each with ice cream please. hmm...hard to pick which one I like best. But I do loove cake! I am so envious of your blueberry collection! I love both! They all look delish! Yes but I also have the opposite problem. A million different recipes to make, not enough time to make them all! oh my... love your virtual blog!! amazing mix!! i never say no to blueberry cobblers! i wont be able to just choose one! Grace I love clobers, all types and these look specially yummy!! They both look great! I tried the Pudding Cake too. I made it with blackberries. We couldn't wait until it set to dig in and there was a definitely a goo factor but, while it wasn't terribly photogenic, it was delicious! Both sound delicious - but I'd choose option B if I had to. It looks absolutely packed with blueberries! Mmm.. I pick B.. because gooey sounds good right now. :) I always hate it when there are so many good choices for one type of recipe.. I am terrible at making decisions. These both do look so very delicious! Looks so tasty & moist!! Just perfect!! I used to make cobbler like choice A. Easy and fast. 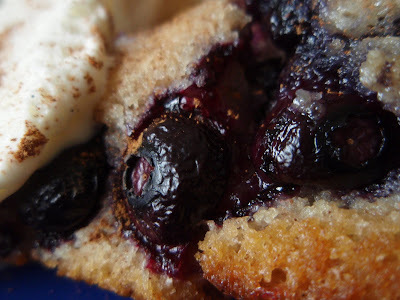 Then one night I made a French cobbler, with just a thin topping, and my guys were hooked. Try it. You'll be really wracked with indecision! Mmm, they both look great - yum! they both look wonderful! great with ice cream! hmmmmmmm goo. Clearly there are two winners. Wow. And did you get to enjoy them both? Cool! I like version B. Never was a cake person, but gooey? Mmm! Grace I'd have to have both, making one on a day when I preferred gooey and one another day when I preferred cakey. It's all good!! Send me samples of both and I'll be happy to help you decide! They both look mighty tasty to me. I'll take some of each with extra whipped cream please. 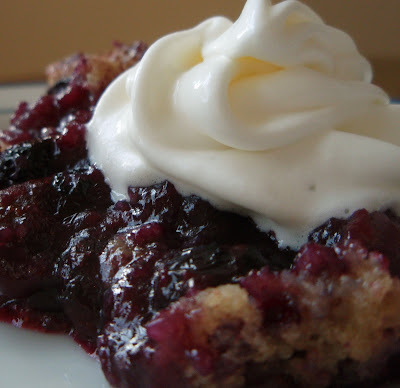 "Ain't" sounds suspiciously like "A"
It's a blueberry cobbler throwdown! Yes! I like B, but they both look delicious. Mmm..what a great decision to have to make (or not to as the case may be). I'd probably lean towards the crunchy bits. Aaaahahahah, resistance is futile! You kill me, girl! The cobblers sound wonderful. I know what you mean about finding multiple recipes. I often print out a gaggle of them and lay them out side-by-side, finding the commonalities, the elements I like, and morphing them into one super-recipe. Excellent tests! They both look good - I'd also be hard pressed to name a superior one. That title has to be one of the best tongue twisters of all time! I dare you to say it fast 5 times! I would not have to be dared to give this recipe a try. Both sound wonderful, although I am partial to pudding cakes. Awesome photos! YUM! If I'm going to be clobbered by anything, I want it to be cobblers! Grace, everytime I visit you I just wish your food was sat on my table infront of me! I love blueberries and this sounds and looks wonderful. Your cobbler looks so yummie, I like the gooey one! Both options have my mouth watering, I will have to give one a go on baking night! You made two cobblers!! You go! I would be huge if I ate all of that, but that doesn't stop me! Hmm which one to pick? I bet both of these delicious cobblers are outstanding! Yum! I love a good cobbler. I think both types look delish! And I would like a piece of both right now. For my breakfast. Yes. Cobbler is my favorite!! Especially w. vanilla ice cream on top! Both versions look amazing to me! Please, do tell, who helps you eat all the amazing goodies that you make? Love that sloppy mess with the whipped cream (or is it ice cream) picture. But it all looks good. Mmmm, there's no such thing as a bad blueberry cobbler. I am MUCH the same way and ALWAYS have to either combine recipes or make lots of versions. Both of these look luscious...I couldn't choose between them because i've never met a cobbler I didn't love! Great pictures, too! I wouldn't be able to decide either, so I'll take a piece of each! !